Finally this week we are getting some snow! After 7 weeks of no snow for my XC ski class on the 8th class it stormed like mad. In fact we have so much snow falling that visibility was less than 200 meter in the car. I got less than 2 miles from home and turned back. The class is 50 miles aways at Pajarito Mountain, so I was not going to risk it, plus it was another 3000 feet in elevation so the driving conditions would be even more intense. Of course that made for some great dog / snowshoe running in my own backyard, which really is the best thing anyway. The day before I got a nice trail little trail run in with such great sunshine to keep me warm I got into my shorts. Beyond that I am working on a bunch of new strengthening stuff that I really like. It is easy to get done, and there is no excuse not to do it. Kinetic Revolutions 30 day challenge is a guarantee to get those glutes firing. This is one of the few internet based exercise/strength/mobility programs for runners that I think is honestly good and not arbitrary and/or without progressions. It makes a lot of sense. I am at day 14. That is it for now, I am working on my dream of rebuilding a vintage shasta trailer into a gallery/mobile printshop, right now it is only in my head. And looking for a Vandercook letterpress. And to hide it here as the last sentence, I am going to defer my Boston Marathon this year and dedicate my time to running out here in the southwest. You can also check out my art printmaking blog here. Soon I will start on some sports specific prints and send them over to my Etsy store, but not before March 15. I am often judgmental of the articles on how to keep motivated during marathon training or just running in general was ridiculous. If you are not motivated, doesn’t that mean that you just don’t want to do it, and that is okay? If I want something I am going to do it. If I am not that excited for something, I am not going to do it. Pretty simple. When I am in NYC, I will run every time someone calls me which can be twice a day. I will run in NM every time someone calls me (thought that never happened until very recently). When I am motivated I will get up at 5am and drive 100 miles, round trip, to run with friends in SF. I will rent an apartment, even if I only live there on the weekends to run with friends, to cut down on driving time. I love to run alone too, but not every day and not 15-20 miles and not on the side of a busy two lane road or getting chased by dogs. Boston is still 8 weeks away but I have lost interest, not motivation, but interest in completing my training, boarding the dogs and flying out to Boston. I missed two 20 mile runs already. At first I thought my 4 hours of XC skiing could cover part of that, plus I had a 2.5 hour run on the trails, but it is not the same as 20 miles on the road. I realize the real joy I get, is in training with my friends, the shared pain of hard runs, long runs, cold runs, sweating bullets runs. Don’t get me wrong, I want a PR, I want to run hard. When I can’t run hard, it is just not as fun. I like hours of X-C skiing on the weekend, snowshoeing, daily hikes with the dogs and yes running. But I don’t want to wake up every morning and think about what my prescribed workout is, I just want to run and explore so that I can have time for my other activities, like making art which is my profession. I have a fall exhibition to work on now. I met a guy a couple of years ago on a 50k run who told me he never raced, but he ran all distances and mostly ultras. I was out for a 17 mile run and met this group on the same course, so I joined them, and completed 50k because I enjoyed being with them. I could not understand just running to run and not racing. I run to race or do I? I thought training in NM would be the best and yes it is pretty darn sweet especially in the mountains, but I am not getting fitter. I like to blame it on the altitude, I love reaching new levels during a training cycle, but it is not happening. I honestly don’t know, maybe I lost my motivation or was that my interested? How many weeks to Boston? Friday’s run on Forest Road 100, Youngsville photo by Robert Frislie. In the past I have been fanatic about my run training. I haven’t gotten lazy, but based on all my marathon times, there is minimal time between a 45 mile training week max and 70 mile training week max. In fact my 70 mile weeks yielded some of my slower times. I have been a bit casual about my training this winter, especially when I get the chance to go skiing which I do every Saturday or hiking, which I did today. Last weekend, when I did not post, I was out snow shoeing. I will do my long run, this week 16 miles, (making it a medium run in the big scheme of things) on Monday. I planned on running 16 miles on Friday so that I could ski for 4+ hours on Saturday and hike Sunday. 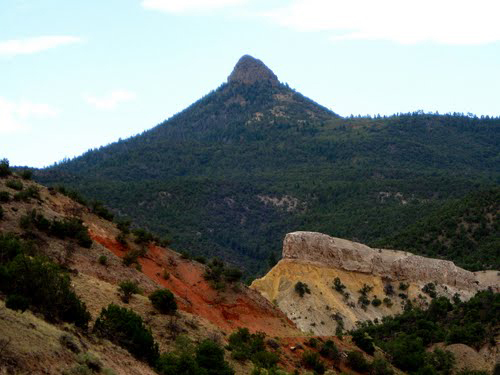 I drove about 30 miles to a forest road that leads up a popular mountain called the Pedernal in Youngsville NM. (That dark peak on the left of the photo is the Pedernal the red is where the road goes.) The asphalt road has been tearing up my feet and I just can’t run on it. I spend all day on dirt, so even 10 miles on the road really affects me. I parked on the side of the dirt road, it was hard packed and dry. I began my run up, and up and up. This was killing me as the incline was only up the mountain. In less than 4 miles the elevation changed from 6100 ft to 7200 ft. The dry clay road turned into mud, then 100% snow. I felt defeated and knew I was not going to run, or crawl 16 miles and I turned around and ran back down. That down was fun. The scenery on forest road is spectacular. I did not bring my camera but I found this photo by Kevin Wolfe. I am feeling ambivalent about going to Boston. I have now for two weeks. I had so much fun last year. I ran with my NM buddy Andy for 23 miles of the marathon. I made a new friend, Ayako, at the Hostel and we planned on staying together again. I rode Amtrak from NYC to Boston with a bunch of my Front Runner Buddies and hung out with my Dashing Whippets Racing Teammates at the expo. But now I am out in NM. I love it out here and I am not so sure I want to board the dogs, make the ridiculous series of flights to get to Boston and spend the money when I can be out here running in the mountains. No matter what I will keep up the training, but I am kind of looking for an out. I don’t know, we’ll see. Maybe I will feel different after I get a few 20 milers completed at altitude. It is rather daunting. 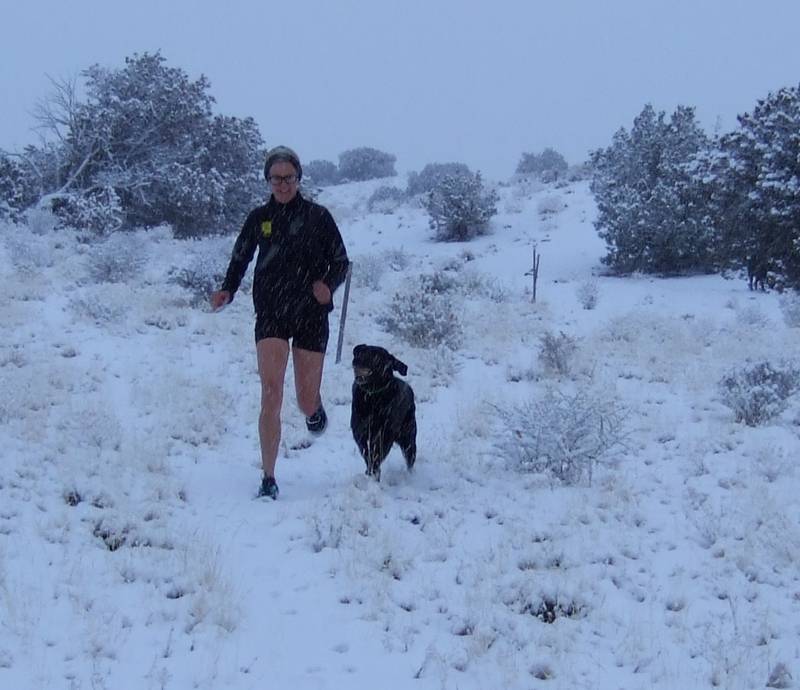 Next Sunday I will do a mountain run with my Santa Fe Strider buddies, that should shake some thoughts loose. I love to run with people, it is a great social outlet, doing this alone is a little lack luster and nerve racking. I get attacked by dogs on the rural roads, and stupid guys in pickup trucks throw beer cans at me. It is hard to stay excited when I know I will face both of those things every time I go out. But the bottom line is, I love to run. Until the next post, stay outdoors!